The end of the year is drawing closer and as the month of May comes to a close, it’s time for an update on what the 2A class has been up to in their penultimate month in the class. 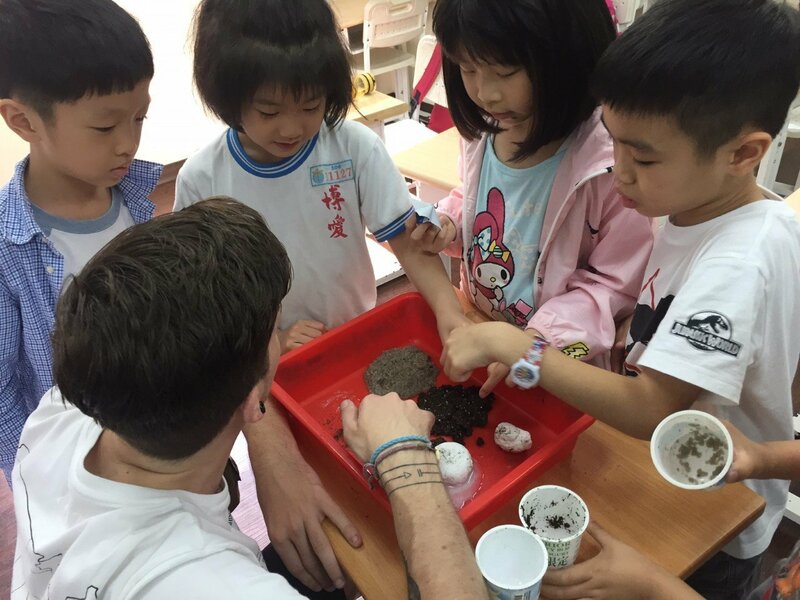 The students have all continued to improve with each passing week and over the past month we have covered the themes of Farm Plants, Insects, Earth and Recycling and the Solar System. In Science, we first looked at soil quality during Farm Plants week, examining different soil types in order for the students to understand what the optimum soil is for different plants to grow. We looked how each of these soils retains water and what happens when we mix the soils together. The following week, the students got the opportunity to design their own insect. 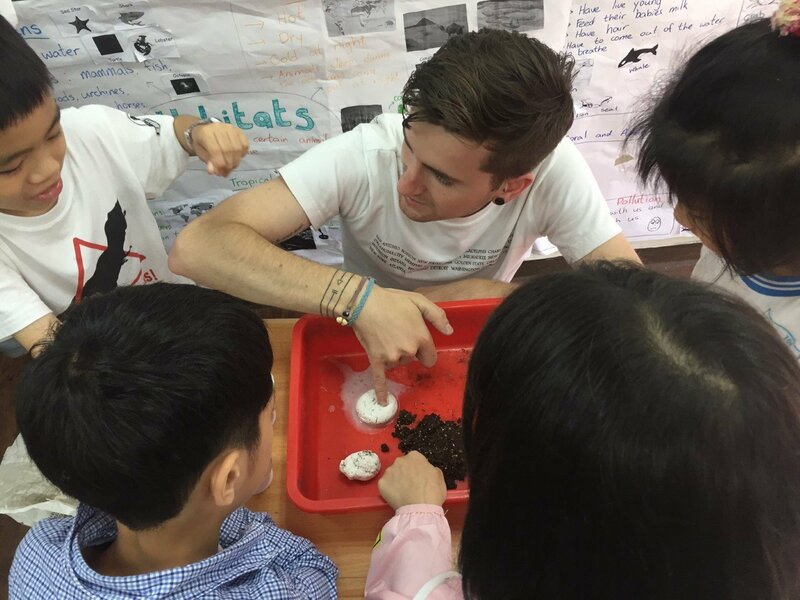 After having studied the specific characteristics that make an insect and insect, the students designed their own insect, ensuring to have a three body part, two antennae insect with the option of including a number of defensive features such as stingers, pincers or camouflage. 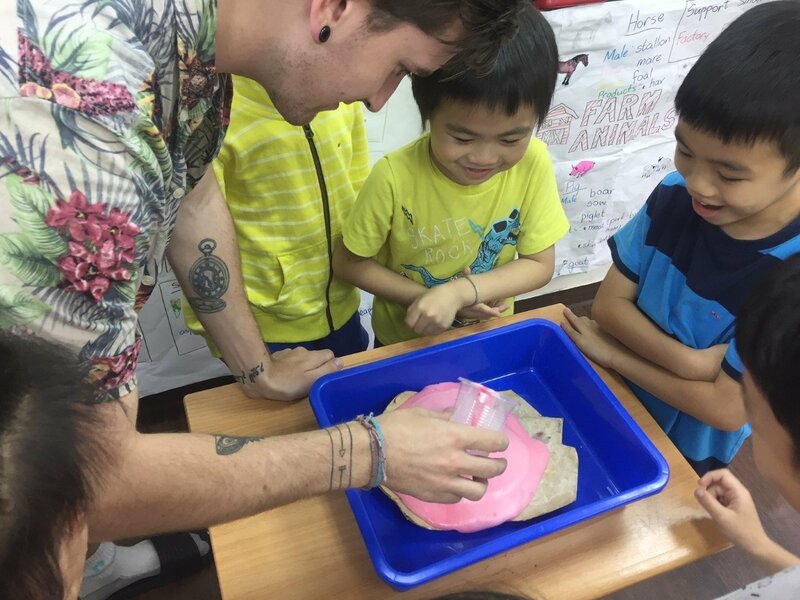 During Earth and Recycling week, the students worked with play dough in order to better understand how different landforms are formed including mountains, rivers, lakes and volcanoes. 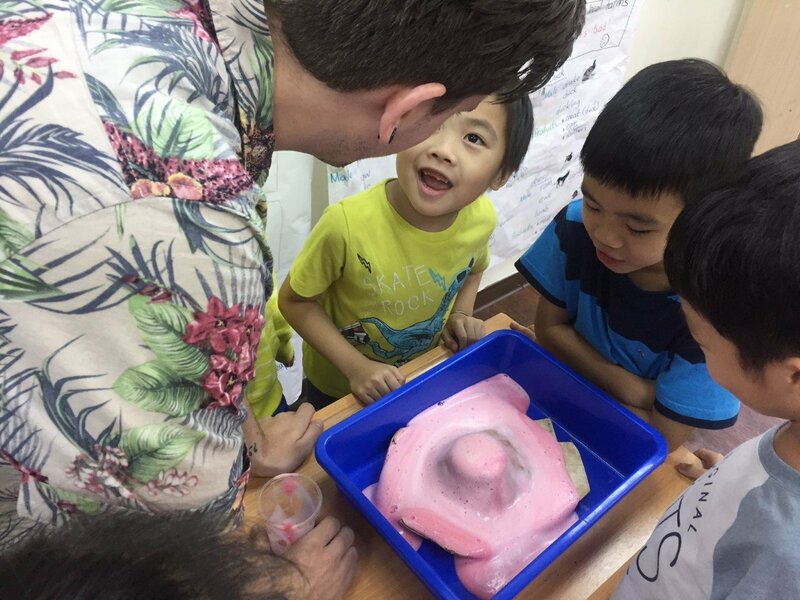 We then looked at a volcano eruption so the students could fully recognize how these extraordinary occurrences can cause a buildup of land. Finally, during our week of study on The Solar System, the students learned about revolving and rotating and how a day and a year are much different on other planets than they are on earth. In Reading class, we continued with our Songbirds books which the students have been doing very well with. Over the past few weeks, the students have been introduced to reading skills for dealing with four and five letter words as they became accustomed to some double consonant sounds such as ff, ll, ss, zz, sh, ch, wh, th. These are quite a challenge for the students but I am very proud of how well each of the students has been getting on with this task. Over the past month, we have had a lot of fun with role-plays as always. The students worked at caring for their very own farm, planting seeds, watering the sprouts and harvesting the fruits and vegetables which subsequently grew. The following day, the students set up their own stalls at a farmer’s market where they bought and sold each other’s products. The next week, after having designed their own insect during Science class, the students then got to construct and build their insects using play dough and clay. They then presented their idea to the rest of the class with each of the other students asking questions about the body parts and defense features. During Earth and Recycling week, the students played a game of charades with a theme of pollution, acting out different causes of water, soil or air pollution with the other students guessing what the cause was. They then designed a recycling box for the classroom and separated the trash from the previous day so they were aware of the waste that was being incorrectly thrown away when it could have been recycled. Finally, in the last week of the month, the students took a tour of the solar system, visiting each of the planets on their class rocket. The students have continued to surpass my expectations during the month of May and I’m looking forward to see what the month of June brings!